I learned today of the sudden death earlier this month of Andrew Patner, longtime Chicago music and culture critic and commentator with WFMT radio and various print publications, whom I had known as a classmate at the College of the University of Chicago in the late 1970s. I've been remembering the time that Andrew and I (and 23 other people) were arrested together on the U. of C. campus on 22 May 1979. I had met Andrew casually before then, but I knew him mainly through his writing as the editor-in-chief that year of the student newspaper, the Chicago Maroon. At that time, the College of the U. of C. was still a small college with, as I recall, about 2,500 students -- few enough that most students in the same class had at least a passing familiarity with each other. In early 1979, the new President of the U. of C., Hanna Gray, announced (a) that a major donor (for whom the building housing the Political Science department, my major subject, was already named) had underwritten a $25,000 cash prize for "outstanding contributions to international understanding", and (b) that the first (and, as a result of the fiasco that followed, which nobody wanted to repeat, the only) recipient of the award was to be Robert S. McNamara, the Secretary of Defense during the American War in Vietnam who had gone on to become the President of the World Bank. "Are we giving McNamara a prize for increasing our understanding of the Vietnamese people from 30,000 feet? ", one speaker (possibly Studs Terkel) asked at a campus teach-in the day of the award ceremony. This being the U. of C., the teach-in was actually a serious intellectual and educational event, and I attended as much of it as my class schedule permitted (this being the U. of C., and I being a typical -- in at least some respects -- U. of C. student). If you zoom in, you can see that I'm wearing what I think was a "No Nukes" button -- a mushroom cloud with a red circle and slash over it -- while Clark, characteristically, is wearing a cameo of Mao Zedong on the lapel of his leather jacket, over a "Rock 'N Revolution" T-shirt from the Revolutionary Communist Party affiliated punk band Prairie Fire. Much of the teach-in was devoted to rebutting claims by defenders of U. of C. President Gray that McNamara deserved the award for his subsequent work at the World Bank, despite what he had previously done as Secretary of Defense. If anything, however, McNamara was responsible for more human suffering as the efficient, businesslike, technocrat who moved "structural adjustment" from the crackpot theory of a few radical-right economists to the dominant paradigm for the World Bank and the so-called "international financial community" in its dealings with the global South, than as the efficient, businesslike manager of the escalation of U.S. war in Vietnam. There were plenty of critics within the U. of C. of "structural adjustment" and McNamara's role at the World Bank. The U. of C. is known to outsiders as the home of a business school and department of economics dominated by devotees of Milton Friedman, the patron saint of structural adjustment theory. Friedman himself retired around the time I arrived at the U. of C. But he still spoke on campus from time to time, and I went to some of those lectures. It was remarkable how surprised he was to be challenged, and how unwilling he was to engage with anyone who questioned his assumptions. But the U. of C. wasn't the monolithic institution that outsiders often think it to be. It is (or at least was) also the home of large numbers of radical political economists and scholars in other departments strongly opposed to the economic gospel of the "Chicago Boys", and even more strongly opposed to Friedman's dogmatism and cult of personality and ideology -- an embarrassing discredit to the U. of C.'s scientific and scholarly credibility. Some of the most powerful and rigorous critiques of McNamara's role at the World Bank that I heard at the May 22, 1979, teach-in were delivered by scholars in exile from Chile and other countries on the receiving end of the World Bank's ministrations. The teach-in was a warm-up and recruiting rally for a demonstration that night by well over a thousand people, some said as many as two thousand, outside the award ceremony in the Reynolds Club. The crowd was drawn overwhelmingly from within the U. of C. community, and was huge in relation to the size of the student body (about 7,500, as I recall, including the graduate and professional schools). Many faculty members boycotted the banquet, and rumor had it that President Gray had to send out several rounds of invitations, many of which were rejected, before she could recruit enough guests willing to cross the picket line. There were no plans for an actual blockade of the building where the awards banquet was held, and none of those who came to honor McNamara were more than verbally abused. But as we were figuring out that McNamara himself had evaded us, an effigy of McNamara was burned. At about the same time, Ron Kovic wheeled up to the front steps and called on McNamara over a bullhorn to come outside and talk to his critics. 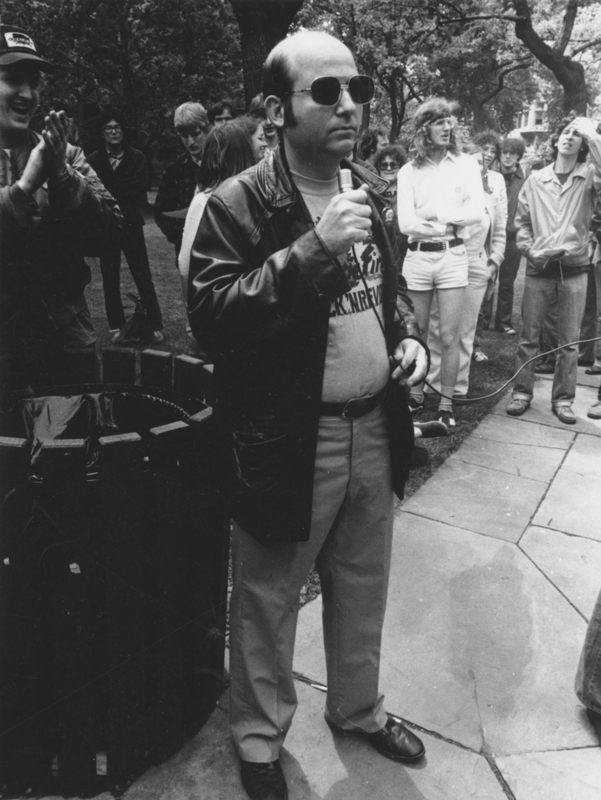 As Ron Kovic was speaking, a man in a suit with a bullhorn of his own stepped up beside him and started trying to say something to the crowd. Neither bullhorn was loud enough to reach a crowd that size, and in competition with each other and the surrounding crowd, both were unintelligible even to those of us nearby. I had no idea who the man in the suit was, but most of us assumed he was some sort of University official. He wasn't wearing a tuxedo like most of the dinner guests crossing the picket line, and his "uniform" was that of a businessman rather than a cop. A Yippie student who had come prepared with a pie for McNamara, but who had given up on getting a shot at him, decided that this officious suit-wearer trying to talk over Ron Kovic was the most deserving target he was going to get, and planted a cheescake squarely on his face. It turned out that the man in the suit was Thomas Lyons, the Deputy Superindentent of the Chicago Police. Apparently, Lyons had decided that things had gone too far, either with the effigy-burning or perhaps with some mistaken fear that Ron Kovic was going to lead a charge up the steps in his wheelchair and incite the crowd to storm the building. The Chicago Tribune's front-page story the next day claimed that Lyons was trying to tell us to disperse, but nobody I knew heard that. The entire block had been closed off all night by the Chicago police. But until now most of the city riot squad had remained behind their barricades at the ends of the block, and in buses around the corner, and had left it mainly to the University police to engage directly with the picketers. That was typical of the general division of de facto jurisdiction between the city and the University in that era: The city provided only minimal policing or municipal services in the Hyde Park neighborhood, which was the heart of the only non-machine ward in the city, and left it to the University to provide its own police, plow the snow, and provide many other services, even on nominally public streets through the campus. But the city and its police also tended not to interfere with how the University and its own police force handled matters within its fiefdom -- as long as the University kept any of its problems "contained" within the sharply-defined borders of the Hyde Park neighborhood. It seems pretty clear that the University had asked the city not to intervene or prevent a peaceful rally, and that the city had agreed to let the Univerity try to deal with events on its own, with city police in reserve and to be let loose only if things got out of hand. Not surprisingly, things did get out of hand when the police superintendent was pied! Seeing their commander's dignity sullied, the Chicago police broke ranks and charged the crowd, clubs swinging. The first person I saw arrested was Andrew Patner, who was standing (in the striped sweater in this photo) next to Ron Kovic taking notes on Ron's speech. Cops knocked away his pen and reporter's notebook, then hauled him away. Having gotten the press out of the way, the cops next dumped Ron out of his wheelchair and carried him off. I looked around to find myself in between the forces of law and order on one side, enraged and flailing wildly as they ran toward us, and the "mob" in the other direction, sitting down on the pavement to calm those around them and to try to avert a panicked flight in which more people might get hurt. The choice was clear. I sat down, rather than try to break through the police line of attack. Moments later, I was grabbed up and thrown (I mean that quite literally) into a police van. Clark Kissinger, along with Ron Kovic one of the few "outside agitators" arrested with us students, was thrown in behind me. The police violence was sufficiently intense that most of those who could flee before they were caught up in it did so. Only 25 of the hundreds of people in the street were arrested before the rest had scattered, although I'm told many people regrouped a little later on the Quads, which weren't a public street and where the city police were thus less likely to follow or intervene. We were kept overnight in holding cells, and released the next day on our promise to appear in court a few weeks later to answer to charges of "mob action", pursuant to an Illinois law that I believe dates to the Haymarket police riot. The arrests only further embarassed President Gray and the University. President Gray apologized to McNamara for our having spoken truth to power, but simultaneously announced that the University wouldn't press charges in court or bring internal University disciplinary action against any of us. On its face, that was a strange statement: The criminal charges hadn't been brought by the University, and couldn't be withdrawn by the University. It wasn't as though we were charged with trespassing or any offense against the University. And we were arrested in a public street, not on University property, so it's not clear what basis there would have been for University discipline. The reality, though, is that somebody (many of us suspected that it was Andrew Patner, through his family connections) got us all a lawyer, and the University prevailed on the city in back-room negotiations with the city and "our" lawyer (whom we never met) to drop the charges. From the limited conversations we had after our arrests, and what he wrote in the Maroon and said in later interviews, my impression is that Andrew was uncomfortable with the dual roles he found himself in as both a journalist and an arrestee. He was clearly sympathetic with the demonstrators, but he wasn't in exactly the same situation as the rest of us. He was arrested for being a reporter, not for being a protester -- not, of course, that the Chcago police were or are known for their ability to make such subtle distinctions. But I don't think Andrew wanted to distance himself from the rest of us by saying that he wasn't in sympathy with us. He might, perhaps, have been arrested as a participant if he hadn't been covering the demonstration as editor and reporter for the Maroon. Interviewed by the Chicago Tribune a few months later, Andrew didn't mention that he had been arrested himself. And he talked not about whether McNamara deserved praise or condemnation, but about how President Gray's unilateral decision to give the award to McNamara violated the University's sense of itself as a democratic, participatory "community of scholars". I wouldn't be surprised if these events were part of the process through which Andrew found out that he was more comfortable as a critic and commentator -- observing from both within and without, and overtly opinionated -- than as either a pure participant or an "objective" journalist. That's a role I value, and that's poorly accounted for in much of the teaching of journalism. If Andrew didn't make as much of a fuss as one might have expected about having been arrested for committing journalism, perhaps that's because he wasn't quite sure what hat(s) he was wearing that night, or whether he could wear more than one. Perhaps this experience helped him find the one that fit him best, and that he would wear for many years after. One thing led to another. Andrew and I (and, I believe, the Yippie who threw the pie at the police chief) all dropped out of the College over the course of the next year. I went on a leave of absence in early 1980, got involved in organizing resistance to draft registration, and never re-enrolled. Andrew came back to the U. of C. a few years later as a student at the Law School, but left once again without a U. of C. degree. There's an honorable tradition of successful U. of C. dropouts, and to its credit, or in order to claim credit for our successes, the University recognizes us as part of the alumni community "ex-degree". One of my other political mentors and dearest friends, the late Eric Weinberger -- who would have been indicted with the Chicago Eight (later the Chicago Seven) if the FBI had been able to figure out how he travelled to Chicago for the demonstrations outside the Democratic Convention in 1968 -- had also dropped out of the College of the U. of C.
I haven't been in touch with Andrew since 1979, but from time to time I've come across mentions of his successful career as an arts critic, cultural commentator, and civic chonicler. I was surprised and saddened to learn of Andrew's death, and I send my condolences to his partner, friends, and family.